Support the Door County Land Trust today! A donation to the Door County Land Trust helps protect Door County’s exceptional lands and waters…forever. By making a donation to the Door County Land Trust you will join more than 2,200 other Land Trust supporters who care about the current and future well-being of Door County. 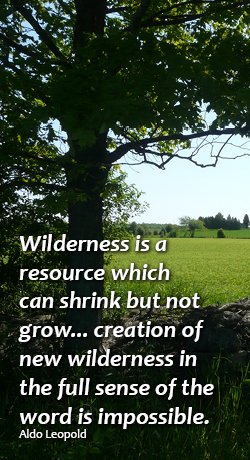 make land available to the public for hiking, cross-country skiing, canoeing, hunting, fishing, and the quiet contemplation of nature. Membership dollars are used for land acquisition, stewardship and restoration on the nature preserves, volunteer projects, and educational activities and events. Begin your membership today with an annual or monthly gift. When you give a gift membership to a friend or family member, you are sharing your love for Door County. 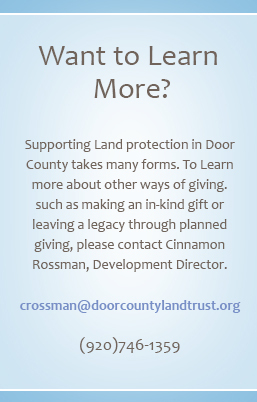 Gift recipients enjoy all the benefits of membership, and the Door County Land Trust puts the contribution to good use protecting and caring for cherished lands. When you make a gift to the Door County Land Trust honoring a friend, family member, a special event, or the life of a loved one, your gift lasts as long as the land does – forever! Making a gift of stock or securities is as easy as picking up the phone. Click here for necessary information for your broker. We invite you to join the many businesses that support the Door County Land Trust and become an Annual Business Member. As a Land Trust business member, you will be demonstrating your commitment to making a lasting difference in your community and the future of Door County.